Many organizations today are surviving in the cloud environment with many concerns, revolving majorly around cloud security, but on following the best practices, public cloud deployment can become much securer than their existing internal structures and data centers. From the nascent stages of this era of cloud computing, cloud security challenges have been one of the biggest concerns amongst most firms considering the implementation of public cloud. For most enterprises, the very idea of storing their data or running their applications on some infrastructure that is managed outside seems an inherently insecure one. As per the recent statistical predictions, through the coming year 2020, public-cloud IaaS i.e. infrastructure-as-a-service workloads would suffer at least sixty percent lesser cloud security incidents than those suffered from conventional data centers. All thanks to their large scale expanse, the public cloud providers always have those resources needed for hiring big teams of cloud security experts and for investing in the latest technology. Even big organizations also can’t duplicate such large-scale efforts. Resultantly, public clouds are far more effective than privately owned data centers. However, many surveys show that companies are still worried about their cloud data security with lapses in these cloud services concerning cloud security challenges. Security of data being an integral part of any business, the risks with cloud computing are evidently unambiguous. It is told by many security experts that companies can increase their own cloud security cocoon of these public cloud deployments by strictly adhering to some of the best cloud security practices and deploying the right CASB solution for data loss prevention. As per Gartner, “By the year 2018, around sixty percent of firms implementing right cloud visibility and access control tools would be experience one-third lesser data security failures. Understand shared responsibility models: In private data centers, enterprises are only responsible for managing with their security concerns. But in public cloud, it’s a complicated thing. In public cloud also, some responsibility rests with the IT. Cloud professionals, as well as security people, call this as shared-responsibility-model. Enterprises going in for any specific CASB vendor must review his policies about shared responsibility for ensuring that they known which aspects of cloud security is under their management radar. That prevents misunderstandings from happening and curtails the possibilities of security incidents occurring otherwise due to particular security drops off. Staff Training Must on Companies To-Do Calendars: As hackers and attackers are becoming increasingly sophisticated, hacking attacks and phishing attacks are increasing with each passing day. To prevent password hacking incidences, firms need to train their workforce about spotting suspicious emails, selecting strong passwords and avoiding to put company’s data at risk. Additionally, employees should be made to understand shadow IT risks. Deploy IAM Solution: In a recent survey, respondents replied unauthorized access (53%) and accounts hijacking (44%) as the 2 largest cloud security threats. Both these security threats can be well mitigated with the deployment of top-quality identity and access management solutions. Experts suggest organizations to look for IAM solutions allowing them to enforce access control policies having data access permission restrictions as well as 2-factor authentication to reduce the risks of unauthorized access to critical data, even after hackers steal user ids & passwords. Additionally, firms must fetch such IAM solutions, which work across their internal structures hand-in-hand with their cloud deployment as well, which only a CASB solution can do. Consider a 3rd-Party Security Partner, Preferably a CASB Vendor: Cloud access security brokers provide CASB solutions designed for enforcing cloud security and access restriction policies. They have become very popular nowadays as more and more firms are beginning to use such services. Developed by domain experts in the field of cloud security, CASB solutions are proving highly effective in averting data loss damages through real-time user access monitoring. Following the best cloud security practices can help the organizations greatly in reducing their security threats, while still availing the advantages of cloud. 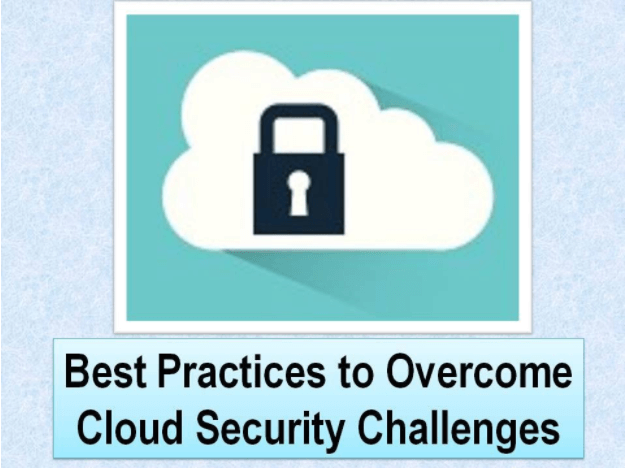 CASB is the best practices to overcome cloud security challenges.